Of course the recycling of breadcrumbs occurs in cultures around the world, from Italian panzanella and pangrattato to Spanish migas, Japanese panko and Lebanese fattoush, but on the sweeter side of things, it seems to be our homegrown puds which really excel. Bread and butter pudding is, perhaps, the one that’s been most widely accepted around the world, often dropping the ‘and butter’ (surely the best bit?! ), while summer pudding still elicits the occasional raised eyebrow. Move into the territory of brown bread ice cream and that eyebrow shoots even higher while treacle tart is often met with an openly blank expression. Well today is your day. Whether you’re an American wondering what treacle tart really tastes like, a Brit who’s only ever eaten it in restaurants or even if you’re already a die-hard fan of this classic sticky pud, I’d love you to make this recipe. The version here lightens the breadcrumb load with a grating of fresh pear, is steeped in maple syrup and given a little more texture with the addition of crunchy, creamy nuts. 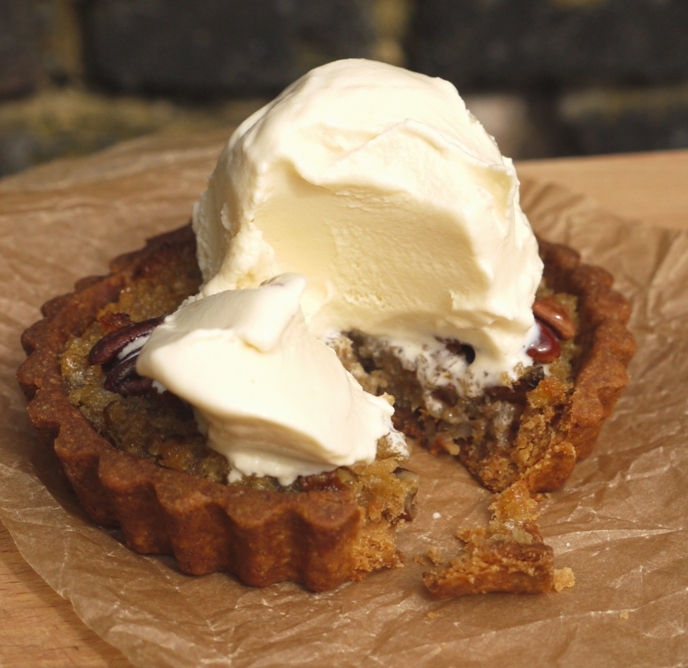 It’s a sort of fruity treacle tart/pecan pie hybrid and utterly irresistible because of it. I baked these in six individual tart cases – four for a dinner party where I’d promised to bring pudding, with two leftover for taking photographs and dessert the next day – but you could also bake it in a large deep tart tin, meaning more oozing golden filling in proportion to the buttery crust. I used sourdough breadcrumbs here but any sort will do – blitz your bread crusts and all for a lovely, rustic texture or whizz them fine for something slightly more refined. After weeks of snow and rain it looks like the weather is finally starting to do what it should for this time of year. Before summer arrives with all its ice creams, sorbets and lovely light desserts, bake up a batch of these rib-sticking little treats, stick in your spoon and rejoice in recycling of the best possible kind. Divide the dough into six equal sized pieces and line up six individual tart tins (mine were 9cm in diameter). This is a cookie-like dough so you don’t need to roll it out – simply use the heel of your hand to press right out to the edges and up the sides of each tin. Once the dough is evenly distributed in the six tins, prick the bases with a fork and pop in the freezer for one hour. When ready to bake, preheat the oven to 190 degrees C. Get your tart shells out of the freezer. Bake for 6 minutes (no need to line with beads) then give them a check. If the pastry is starting to puff up, push it back gently with a metal spatula, then continue baking for a further 8 – 10 minutes until crisp and golden. Remove from the oven (turning the oven down to 180 degrees C) and leave to cool while you make your filling. In a medium sized saucepan, melt the butter with the maple and golden syrups. Stir in the breadcrumbs, grated pear, chopped pecans, orange zest and double cream until combined. Take your pre-baked tart shells and spoon the mixture into each one until just about level with the top of the pastry. 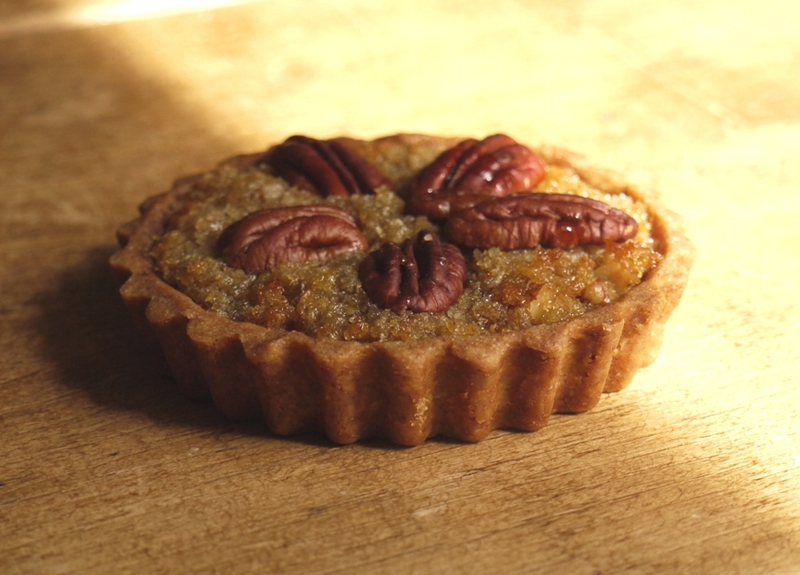 Place the whole pecans on top of the tart in any pattern you like. Bake the tarts for 20 minutes or until lightly firm. Remove from the oven and allow to cool slightly before serving with thick clotted cream or ice cream. The tarts can easily be reheated and possibly taste even better the next day as the filling relaxes into its sticky, syrupy self. We’re coming into winter in Australia so this dessert will be perfect for the cooler days (not that Brisbane gets too cold but we can pretend). I have fond memories of treacle tart from my childhood and I love it with custard. This sounds like a delicious version that is going on my must make list for the weekend. Treacle is any uncrystallized syrup – golden syrup is treacle in its lighter form, black treacle is the darker version – so this is definitely stil a treacle tart! You should be fine to use all maple syrup although the mixture might be slightly runnier. Hope you enjoy it! I’ve never eaten a treacle tart but it is on my list of recipes I want to try. This recipe looks fantastic so I might start with this one! Thanks very much for sharing! i would be one of those curious americans. 🙂 these look so good! 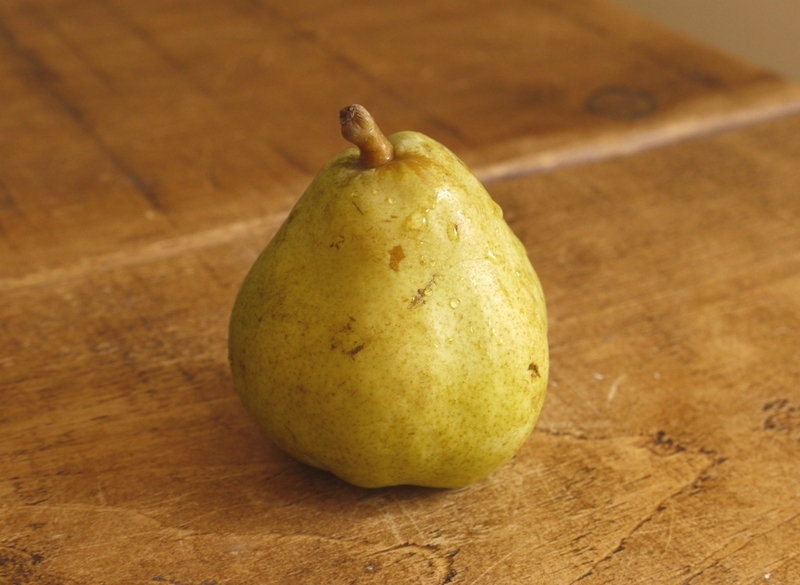 i adore the pear and maple combination! Oh my goodness, this is my dream dessert. 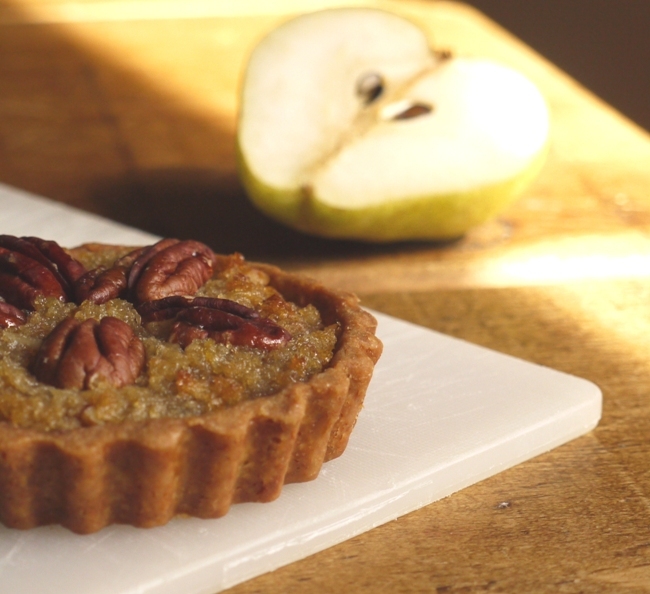 Treacle tart is in my top 5 puddings, I love pears and pecans, and I REALLY love maple syrup! On the ‘to make’ list, what a fabulous recipe! Ah treacle tart. One of my absolute favourites. 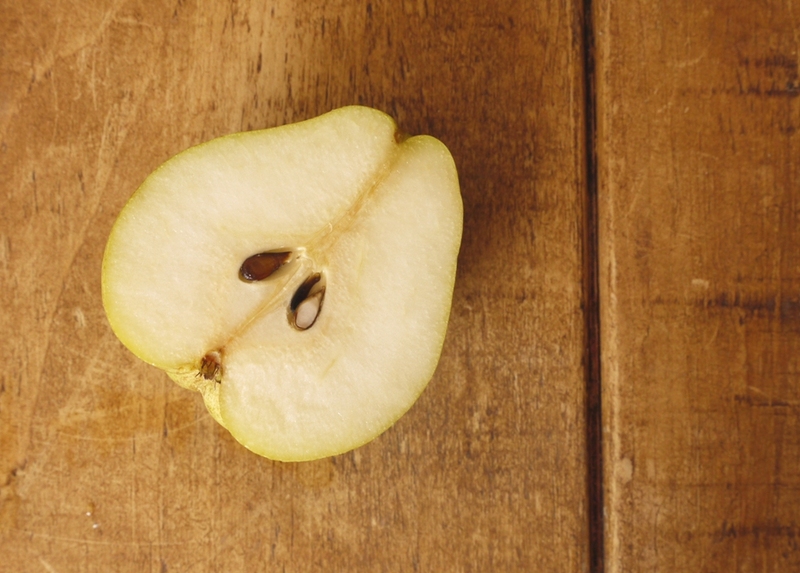 Love your twist on it with the maple and pear. The breadcrumbs in the filling are the most interesting part. And I´m guessing many fruits can be used. I think that what we here call cane syrup should be very close to treacle. It´s what my great grandmother used to make her irish plum puddings. This is a wonderful dessert Kate! This tart sounds so good! and it looks absolutely gorgeous! What a fabulous twist on a classic. Great combination of flavours. Right up my street. That third photo is absolute perfection. Makes me want to try baking a treacle tart this minute… except I am sure it would not turn out quite as pretty. Ah, thank you 🙂 I got lucky with the sunshine – not something we’ve seen a lot of lately! What absolutely beauties – the recipe sounds like a complete winner! I also love that you used orange zest – most recipes I have seen used lemon zest in the filling and I am never sure it works that well with the sticky filling. Oh and pecans and pears and then ice cream? Yup, right up my alley! I think lemon does help lift a treacle tart filling, but with the pears and maple syrup, orange gives it a lovely wintry warmth. She says in the middle of April – ah well, that’s England for you! What could be more delicious and truly English than this beautiful tart and with the ice cream……….oh yes! I’m Old School. To my American ears, “treacle tart” is what the child catcher tempts the kids to come out of the toy shop with in Chitty Chitty Bang Bang. Looks just lovely, and I’ll need to hit the International aisle for some golden syrup. Thanks! Oh that sounds just wonderful, you are so clever, I really would love to make this one – I am a huge treacle tart fan and they always put coconut in the ones you get in the shops which though nice, isn’t quite right. Goes off to look in cupboards to see what ingredients I have …. i love the pear in the mix! i’ll have to bookmark this for colder weather. i’m with my folks right now and it’s lovely and warm and sunny here! What a great pudding. I am always impressed by how neat your pastry is. I just made a sweet tart this weekend but my edges are raggedy even thought I hang the pastry over the edges while baking. Maybe I should wait til it’s cold before trimming it? Anyway it’s great to admire yours, and wish I could eat it too! This tart sounds absolutely delicious! Could there be a better way to ‘recycle’ breadcrumbs?! I believe not. Yum! Time to let some bread go stale…..
Oh this looks so good! 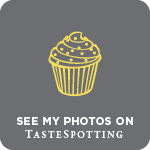 I’ve never had treacle tart–but this definitely looks like something I’d like to try! this little treat looks great! Oh what an enticing combination! Just stumbled upon this. One word – wow! I just made these tonight but had a few problems- did you find it incredibly hard to remove that tarts, despite heavy tin-greasing? A few of mine crumbled they stuck so firmly! How are yours so perfect! Oh no, I’m sorry to hear that. My tartlet tins are non stick which definitely helps… Did any of the filling spill? Sometimes that can make things stick! Hmm mine are non stick too and I was pretty careful with the filling! I think my tart cases are deeper than yours by the looks of things so maybe That’s why! Strange! They were so yummy though!